When discussing the size of horizontal directional drilling (HDD) rigs, professionals typically refer to a unit’s maximum pullback force. The most common industry standard for large HDD rigs is pullback force of at least 100,000 pounds. In addition, other specifications associated with this category of HDD rigs are rotary torque of drill stem and size (diameter) of the pipe. 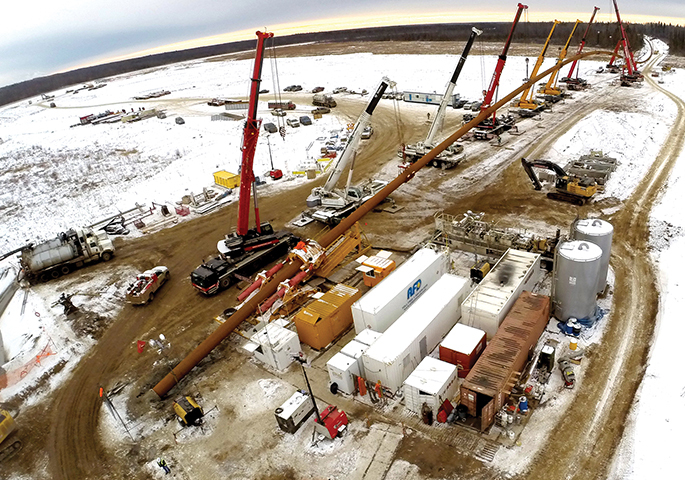 Compiled by Underground Construction, the annual census provides details about contractors that offer large HDD rigs. It serves as a valuable tool in managing successful projects, by assisting with selection of the right-size rig to fit specific needs. Maximum Pipe Diameter: 42 in. Aaron Enterprises offers tooling for environmentally sensitive crossings, engineers on staff, real-time remote monitoring system with client access, soil stabilization, and installation of conductor casing. Maximum Pipe Diameter: 60 in. ARB Inc. is a full-service pipeline contractor performing all aspects of HDD, including drilling services, pipe fabrication and tie-ins, in the United States. Maximum Pipe Diameter: 48 in. Florida’s premier HDD contractor with 31 years of experience and 8 rigs, specializing in subaqueous, rock, water, sewer, reclaimed utility lines. Licensed, bonded and insured. National HDD contractor specialized in horizontal directional drilling, auger boring, guided auger boring, tunneling and microtunneling. We drive Florida-wide and are specialized in Florida ground conditions. Badger has operated in the business for 20 years and has highly skilled technicians. Company specializes in hard-rock formations, with expertise in all HDD applications and technical proficiency in all areas of HDD. Carson Corporation owns and operates one of the largest directional drills on the East Coast and has successfully drilled throughout the country. Maximum Pipe Diameter: 56 in. Australia’s longest-established HDD company providing design, engineering and construction of trenchless solutions for each project’s unique challenges and conditions. Maximum Pipe Diameter: 36 in. We have been in business for more than 50 years and have done HDD work for 20-plus years. Experience is our key to success. Complete services and expert solutions for HDD and river crossings. Industry leader with proven success in some of the toughest drilling environments in the world. 1200 North Union Bower Rd. Driver Pipeline has more than 20 years of experience in the HDD industry offering turnkey solutions to HDD projects. Provides a full line of HDD capabilities, including single and multiple installations for power/communication conduits, fiber optic cables, and water/sewage and oil/gas pipelines. Maximum Pipe Diameter: 52 in. Expertise for projects that are large, small or through hard rock. Capabilities up to 54 inches in diameter and lengths up to 8,000 feet. Maximum Pullback: 750, 000 lbs. Capability to adapt our machinery and procedures to succeed in all types of HDD projects, regardless of size and difficulties encountered. Provides HDD services for the pipeline, utility and telecommunications industries throughout North America, in all geological conditions. Also offers six smaller utility rigs. Gator Boring & Trenching Inc. Serving the southeastern United States with 5 HDD rigs and fusion crews. Specializing in gravity bores, subaqueous crossings and water/sewer bores. H&H Enterprises provides services for all your HDD needs, specializing in solid rock, with capabilities up to 48-inch diameter and 6,000-foot length. Full-service directional drilling company serving the continental U.S., Canada and Mexico since 1994. Completed lengths in excess of 8,000 feet. More than 30 years of experience in trenchless methods including tunneling, pipe jacking, concrete box jacking, pilot tube/guided boring, microtunneling, auger boring and pipe ramming. Nationwide contractor experienced in all geological conditions. Consultation, design and execution specialists offering services to gas transmission and distribution, water, sewer, electric and telecom companies. Directional drilling and road boring for the oil and gas pipeline industry. Laney Directional Drilling offers turnkey trenchless engineering and construction services for horizontal directional drilling, Direct Pipe, microtunneling and pipeline extraction. Maximum Pullback: 1,000, 000 lbs. Horizontal directional drilling, engineering, construction and installation of HDD crossings, outfalls and shore approaches. International contractor with a strong focus on technically challenging projects, particularly EPL contracts. Also specialize in hard rock drilling utilizing patented tooling. HDD and Direct Pipe contractor serving the oil/gas, electrical, water/wastewater and fiber industries. Focused on design/build and engineering/procurement/construction, where HDD and DP are critical factors. Recognized as the industry leader throughout North America and worldwide, in both land and marine, completing milestone projects with inventive HDD solutions. Specialized HDD, pipe ramming and bursting nationwide. Installations include petroleum, natural gas, electric, telecommunications, environmental shore approach, wind energy and geothermal. River crossings, Digitrak F5, on-grade bores, Paratrack 2 magnetic navigation and surveying, pipe reaming, pipeline installation, utility installation, residential and urban installations, plant/refinery installations. O’Connor Utilities installs HDD crossings, including hard rock, outfalls, landfalls, environmental wells, design and consultancy work; and has a fleet of seven midi and mini rigs. Oz Directional Drilling has over 60 years of pipeline industry experience and 20-plus years of HDD experience, completing projects across North America. Highly experienced to complete all your HDD needs, including design/engineering, surveying, solid rock drills, intersects, recovery/rescue and more. Also have 15 drills under 100,000 pounds. Ranger Directional, a Quanta Services company, installs underground product pipelines and conduits, including HDD beneath waterways, congested areas, highways, railroads and other environmentally sensitive areas. Capable of drilling lengths of more than 6,400 feet and pipe sizes up to 60-inch diameter. We are the world record holder for HDD 56-inch. Microtunneling up to 84 inches, HDD bores of 1-48 inches, on-grade sewer with pilot tube system, and steel jack and bore up to 84 inches. Premier provider of energy-related construction products, services and innovative solutions, including one 140,000-pound, one 500,000-pound and two 700,000-pound HDD rigs. State-of-the-art equipment and over 25 years in the industry. Carefully planned and safely executed HDD solutions, and specializing in complex, multi-rig projects. Focused on trenchless construction throughout North America. Services include large and small HDD, auger boring, pipe ramming, microtunneling and tunneling. Excelling at shore approaches, harbor/marine work, major utility installations, and oil and gas projects has made us a trusted name in trenchless construction. More than 100 years of experience and a proven record of service, sepcializing in above-ground and underground pipelines and cable infrastructure.